In the offline world it’s hard to figure out exactly how your business gets a certain reputation, or exactly how “word gets around.” But online this is something you can actually figure out pretty well. There are two kinds of online local-business reviews: ones that have “legs” and ones that don’t. Many IYP (“internet yellow pages”) sites share reviews with other sites. For example, the reviews in Bing local say “Powered by Yelp.” CitySearch feeds 14 other major review sites – possibly more. The same reviews that appear on CitySearch and Yelp appear word-for-word on other sites (often with attribution to the original source). That’s what I mean when I say one site feeds reviews to or shares reviews with another site. Customer reviews written on Google+Local pages pretty much stay at home and eat Ben & Jerry’s ice cream in their bunny slippers. I bet you can’t ask customers to review you on 20 different sites. You probably can’t even easily monitor what’s said about you on the dozens of sites where customers might drop you a review. But if you know the few linchpin sites that feed the others, you can focus your review-gathering efforts on those sites. It’s the 80/20 rule. 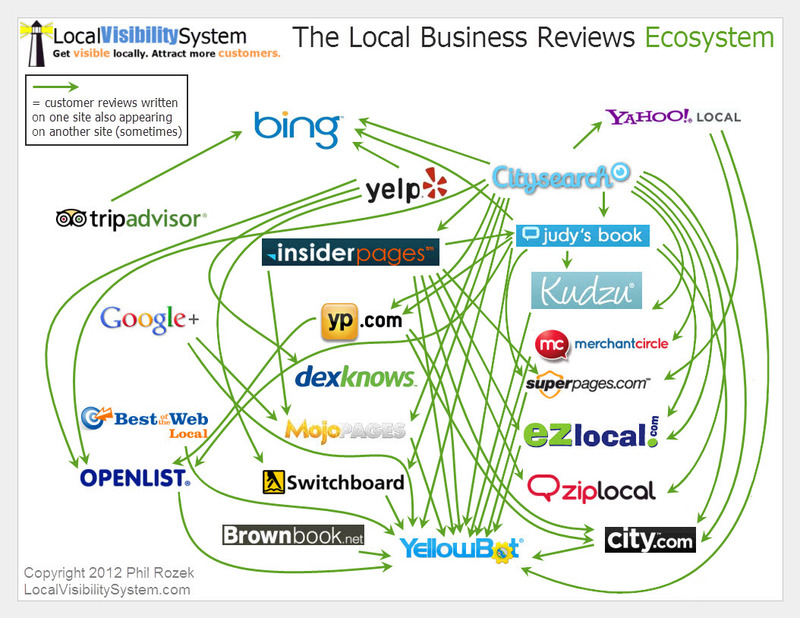 If you’ve ever seen David Mihm’s unfairly awesome “Local Search Ecosystem,” you’ll notice the resemblance. I’ve always liked that layout, and I thought it would be a good fit here. Not every review on a particular site always gets fed to other sites. For instance, even though InsiderPages feeds some reviews to JudysBook, it doesn’t seem that every InsiderPages review for a given business finds its way onto the JudysBook reviews for that business. I haven’t figured out the rhyme or reason, but I do know that the transmission usually isn’t complete. Reviews don’t seem to “trickle” too far. Even though InsiderPages shares with SuperPages and SuperPages shares with YellowBot, I’ve found that you won’t necessarily see a bunch of InsiderPages reviews on YellowBot. The Ecosystem doesn’t include certain types of sites. It doesn’t include paid review-management sites like DemandForce and which sites their reviews are fed to. Nor does it inclue include industry-specific sites like UrbanSpoon or Fixr: the focus is on “horizontal” directories that any business can be listed on. Last, it doesn’t include really little sites: for instance, I know that InsiderPages feeds Goby.com, but I’m not sure that many people here in the States use Goby, nor would that fact change your review strategy a whole lot. Don’t feel like looking at the arrows again, and just want to know which sites I think are the ones you really need to pay attention to and (ideally) get reviews on? 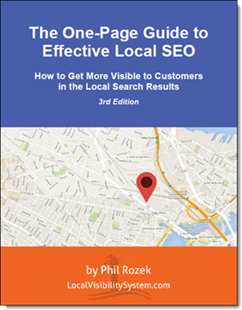 I’d say it’s a three-way tie between Yelp, CitySearch, and Google+Local (although it doesn’t really feed reviews to other sites, it’s Google, so it’s essential). Then InsiderPages, then JudysBook. Not only are these sites the biggest and most popular, but they’ll also spread your reviews all over creation. Yelp reviews will be feeding Apple Maps pretty soon. So in the not-too-distant future Apple will trot into the Ecosystem and start eating some of the other critters. By the way, you may have seen my Google+ review handouts, but I also make review handouts that can help you on other sites. These are all the sharing/feeding relationships I know of. I just know there are others out there. But these are the major connections, from what I’ve been able to tell. If you know of any sites that share reviews, please let me know!